In a clash between the powerful Christian Church and woman advancing themselves with education and natural medicine, thousands of women were put to death as witches. Worldwide witchcraft hysteria began around 1300AD and continued till 1750, four hundred and fifty miserable years for women. These years are now considered genocide with more than 50,000 woman and a small percentage of men and children in Europe and the Americas. Jesus’s message of love, peace and looking after others, lost out to suspicion, lust, evil, greed and control. In this era where piety and silence was expected of all women, a few were breaking that mould, not by suddenly becoming witches, but helping their communities with new skills or those passed down for generations. These were the herbalists, midwives, teachers or anyone that put natural sciences before prayer. Along with these women, the poor were easy targets for frivolous accusations and gossip. Women condemned for the use of witchcraft had little or nothing at all to warrant their deaths, though many confessed to lessen their torture. If a woman looked a neighbours cow and it died the next day – witchcraft – a husband dies suddenly – witchcraft – herbal medicine did not work – witchcraft – someone jealous of your success – witchcraft – someone wants to take anything you own, especially land grabs – witchcraft – a baby dies at birth – witchcraft – unfortunate birthmark – witchcraft – speaking in defence of someone accused of witchcraft – witchcraft – fun little women’s gatherings with dancing – witchcraft. It is not hard to see the travesty of it all. The full picture of these events is hard to comprehend; death by hanging, torture, crushing, drowning and burning, for crimes you didn’t commit. The dangerous book called, The Hammer of Witches written in 1486 (Malleus Maleficarum) by Heinrich Kramer an inquisitor of the Catholic Church. Kramer was eventually denounced by the inquisition in 1490, though the book endured. The Hammer of Witches and other books of the time encouraged a belief in witches, that they were mostly women and taught judges and clergy how to recognise the signs. The powers of the time painted women as some evil seed that could not be trusted unless they spent the day in prayer, housework and never spoke out of term. Women were to get advice from their husbands, not other women! Women were used as scapegoats for just about anything, even crop failures could be the work of the impious individuals. Dark times – yes indeed! 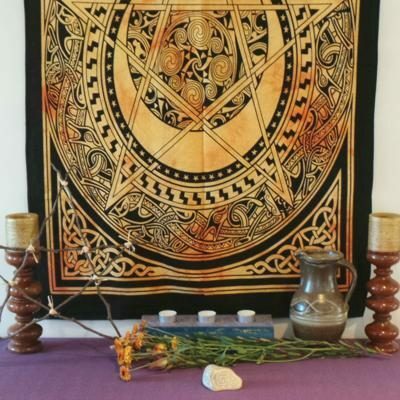 Were there a few real witches around rebelling against the system, who knows, but they probably didn’t consider themselves to be witches, just nature loving herbalists that made a few prayers or positive wishes for something more. A fairly normal thing to do in oppressive times! Shamanic practitioners certainly needed to keep a low profile. It is true that some more remote villages in Europe still clung to a few pagan traditions though they were outwardly Christian. Performing a few seasonal celebrations does not make anyone a servant of Satan; the Church misinterpreted the meanings of these nature cycles. During the conversions many of the pagan gods and their celebration days were taken in and blended with Christian customs. Today some of these traditions are having quite a revival. History reveals that the true evil lies with the accusers, whether they be men, women or misguided children. Few of us could imagine the terror these strong women were put through, especially during witch-hunts and the Inquisition. The courtroom was against them from the first, though the lucky ones with sensible judges heard the hammer call – not guilty. Light a candle for these lives cut short, heal the past by educating others.